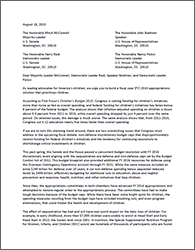 First Focus coordinated this letter to congressional leadership co-signed by 14 organizational members of the Children’s Budget Coalition. The letter observes that budget caps have led to cuts in children’s initiatives ranging from K-12 education to child abuse and neglect. It urges congressional leadership to raise budget caps on children’s initiatives and other “non-defense discretionary” accounts and protect children in any year-end fiscal negotiations.